Sign up for Broadjam today to follow Amy Elizabeth Wheeler, and be notified when they upload new stuff or update their news! Selections from "What Thing Is Love", English lute songs from the 16th and 17th centuries. 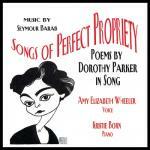 Songs of Perfect Propriety is wonderfully entertaining vintage Dorothy Parker, perfectly matched by Seymour Barab's savvy, inventive blend of American art song, cabaret, and musical theater styles.